Animated STAR TREK - "Yesteryear"
Spock emerges from the Guardian of Forever to discover that history has recorded that he died at age 7 undergoing the Kahs-wan ordeal. Spock travels back to 2237 to save his own life. Spock is successful in restoring the proper timeline, however this time his pet sehlat dies during the ordeal. This episode was a sequel of sorts to the original series episodes "Journey to Babel", "Amok Time" and "City on the Edge of Forever." This episode's writer, Dorothy C. Fontana (pictured), is a very important person to the STAR TREK universe. In the 1960's, Ms. Fontana was the story editor and script supervisor on STAR TREK The Original Series. On that show she wrote "Tomorrow Is Yesterday", "Friday's Child", "Journey to Babel" and "The Enterprise Incident." She also provided the teleplay for "Charlie X", "This Side of Paradise", "By Any Other Name" and "The Ultimate Computer." Under the pseudonym of Michael Richards she wrote the story for "That Which Survives" and collaborated on the story of "The Way to Eden." She went on to write for STAR TREK: The Next Generation, collaborating with Gene Roddenberry on "Encounter at Farpoint, Parts I and II". She also worked on the Next Generation scripts for "Lonely Among Us", "Too Short A Season" and "Heart of Glory". Ms. Fontana also wrote the teleplay for the STAR TREK: Deep Space Nine episode "Dax". Ms. Fontana later provided the scripts for three Babylon 5 episodes: "The War Prayer", "Legacies", and "A Distant Star". 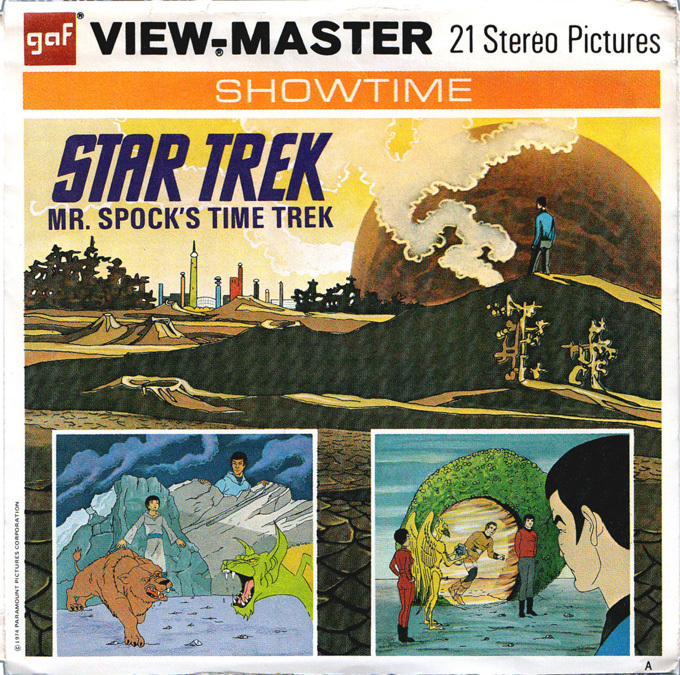 In this episode, Spock makes reference to the formidable range of mountains on Vulcan called Vulcan's Forge. Vulcan's Forge was also mentioned in the 6th season STAR TREK: Deep Space Nine episode "Change of Heart" (DS9). This is a tie-in between the Animated and the current live-action STAR TREK series, which makes the animated series that much more canon! Vulcan's Forge is also the title of a 1998 original STAR TREK book published in 1998 by Pocket Books. This episode, "Yesteryear", established Spock's mother Amanda's maiden name as Grayson. Her maiden name was originally given in an early draft of the script of "Journey to Babel" by this episode's writer D. C. Fontana. We learn that Spock's home town on Vulcan was ShiKahr in this episode. The Miranda-class starship ShirKahr mentioned in the 6th season STAR TREK: Deep Space Nine episode "Tears of the Prophets" (DS9) was named after this Vulcan city. This is another tie-in between the animated series and the current live-action STAR TREK series! 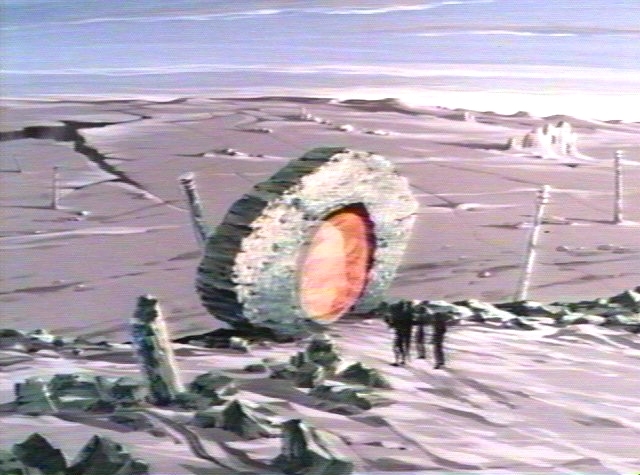 Another reference to the Spock's hometown of ShiKahr was made in the February 2002 Enterprise episode "Fusion" when Tolaris, a visiting Vulcan man, said "I taught literature at the ShiKahr Academy." 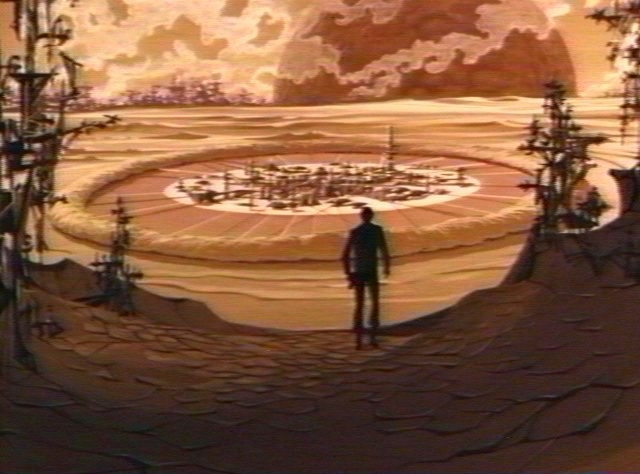 The beautifully remastered edition of the Original Series episode "Amok Time" includes a wide establishing shot of the ancient mating ritual arena on Vulcan. 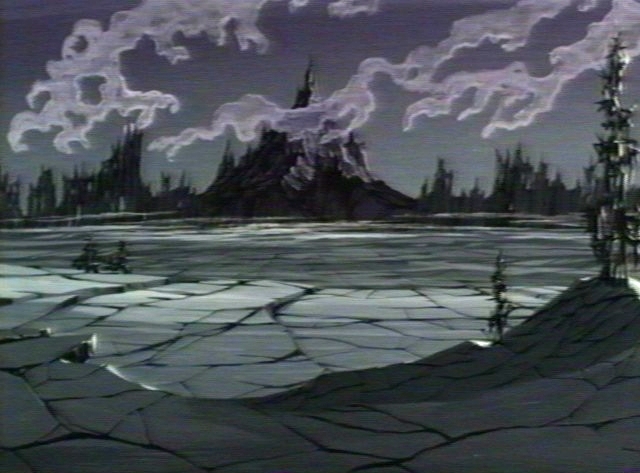 In the distance can clearly be seen the city of ShirKahr exactly as it appeared in this animated episode. 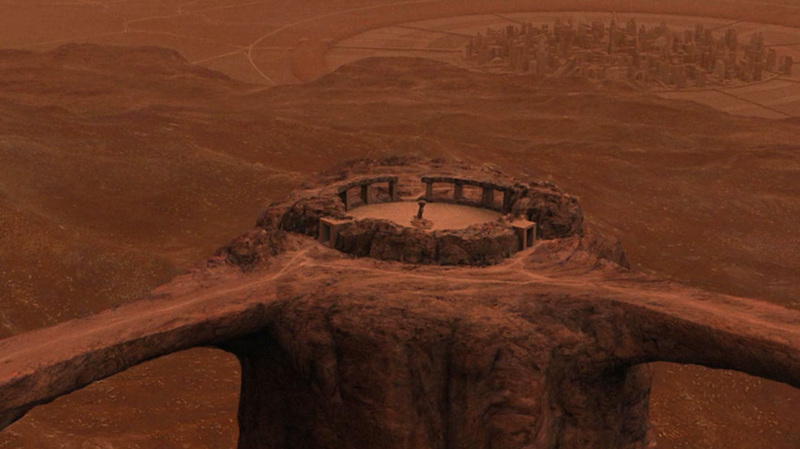 The Kahs-wan ordeal, which features prominently in this episode, was a ritual by which young Vulcan males proved their manhood by facing the dangers of the desert wilderness alone. An essentially similar ritual was described in the third season STAR TREK: Voyager episode "Displaced" (VGR) which was written by Lisa Klink. In that story, Tuvok stated that he took part in the ritual of tal'oth wherein as a young child he survived for four months in the Vulcan desert with a ritual blade as his only possession. It seems that script writer Lisa Klink paid homage to the animated STAR TREK series with this reference. 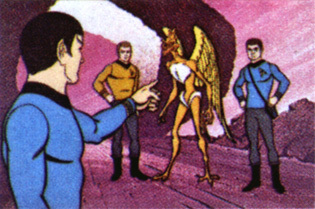 Spock's pet Sehlat, the "live teddy bear with six-inch fangs" mentioned in "Journey to Babel" (TOS), was seen in this episode. 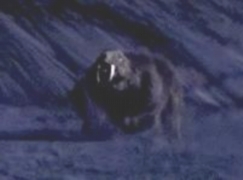 Thirty-one years later, a computer-generated sehlat (pictured) was seen in the November 2004 STAR TREK: Enterprise episode "The Forge." This episode had a visual error: the Le-Matya's head briefly disappeared when Spock squeezes its neck. The so-called "famous six-fingered Spock scene" was not actually seen onscreen. A collector's cel of Spock and characters from this episode featured Spock with six fingers on his left hand. (Picture of the collector cel, 46KB jpeg). Actor Mark Lenard reprised his role of Sarek by providing the voice of the animated Sarek. 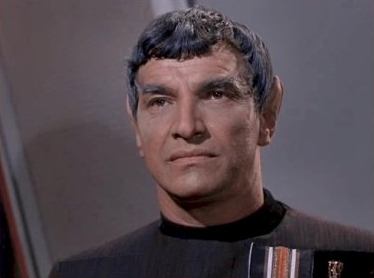 Lenard has played Sarek in the original series, the animated series, STAR TREK: The Next Generation and in the movies STAR TREK III: The Search for Spock (1984) and STAR TREK IV: The Voyage Home (1986). The Le-Matya's voice was a reuse of the voice of Godzilla from Japanese movies. 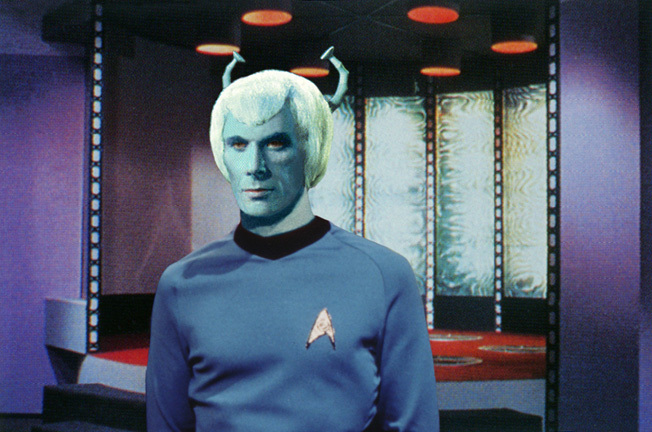 Slight visual error: the Andorian Thelin's skin should have been blue, but in this episode he had greyish pink skin. The Andorians, were one of he founding members of the Federation and were generally a violent people. Andorians were seen in the original series and are very prominent in the recent STAR TREK: Enterprise series. In this story, Spock's pet sehlat, I-Chaya, was mortally wounded and the seven-year-old Spock decided to have him euthanized rather than continue to live in pain. NBC executives wanted the ending changed, but D.C. Fontana refused and Gene Roddenberry backed her up. Again, this was not your ordinary children's show. Even the animated STAR TREK series took on real issues. Spock's mother Amanda was seen in this episode and was originally seen in the original series episode "Journey to Babel." 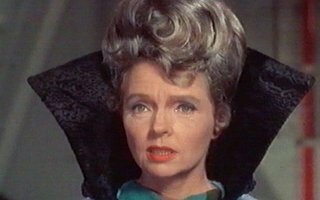 Amanda was played by Jane Wyatt (pictured) in the original series but was voiced by Majel Barrett in animated form. James Doohan did the voices of a whopping seven characters in this episode. The animated series was not considered canon by Paramount and could not be included in Michael and Denise Okuda's reference books. However, they made an exception in the case of "Yesteryear" because of its importance to the STAR TREK timeline. 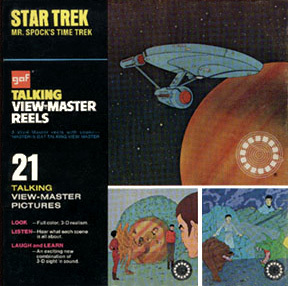 So "Yesteryear" was mentioned on pages 29-30 of their STAR TREK Chronology. There is a page in this site that focuses on the Vulcan desert Flyer that was seen in this episode. Two different Limited Edition Collectors Cels inspired by this episode were once available from Tuttle Enterprises. The cels were number ST-5 and ST-12. (Advertisement showing these cels, 142 KB gif). 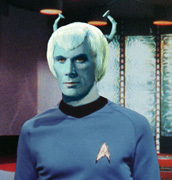 This episode featured an alternate universe in which Andorian Starfleet officer Commander Thelin rose to become first officer of the U.S.S. Enterprise in 2364, some five years before the episode. This meant that in that universe Thelin took part in all of those adventures with Kirk and McCoy depicted in the live-action STAR TREK series instead of Spock. I wondered what Thelin might look like if he were in the original series instead of Spock. Perhaps he would have been played by actor Jack Donner who also played Romulan Sub-Commander Tal in "The Enterprise Incident" (TOS). For fun, I created a "what-if" picture of Jack Donner as Thelin, and it is shown at right. "Yesteryear" was novelized by Alan Dean Foster in Star Trek Log One published by Ballantine Books in June 1974. Also novelized in the book was "One of Our Planets Is Missing" and "Beyond the Farthest Star".